I had been looking to get Rod Bernstine for some time. One of the ‘big backs’ of the late 1980s and early 90s, Rod certainly punished would be tacklers with his aggressive running style. 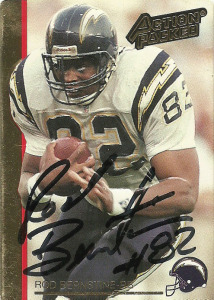 Drafted by the San Diego Chargers out of Texas A&M in 1987, Rod battled fellow bang back Marion Butts for the starting role throughout much of his time in San Diego. An accomplished receiver as well, the Chargers couldn’t really settle on Rod’s role early in his career there, as he went back and forth from runningback to tight end officially on the roster. The classification of ‘H-back’ makes sense, but Rod ran with the ball too much to be considered one. Eventually by 1990 the team had settled on him at runningback, and Bernstine responded with 589 yards and 4 touchdowns in 124 carries. Starting 8 games in 1991, Rod had 766 yards and 8 touchdowns for the Chargers. He’d play one more season with the team, before leaping over to Denver for the 1993 season. Rod started 14 games that year, en route to rushing for 816 yards and 4 touchdowns. He’d also record a career high 44 receptions for 372 yards. He’d retire after the 1995 campaign after two back to back brutally injured seasons. I loved playing Rod on Tecmo. I dominated with him and won a comeback Hail Mary game against Josh by just utilizing Rod as a one man offense for Denver 17-10. Rod does not sign often, but signed one of two cards for me via the mail.